This book offers a comprehensive guide to the world of metadata, from its origins in the ancient cities of the Middle East, to the Semantic Web of today. The author takes us on a journey through the centuries-old history of metadata up to the modern world of crowdsourcing and Google, showing how metadata works and what it is made of. The author explores how it has been used ideologically and how it can never be objective. He argues how central it is to human cultures and the way they develop. 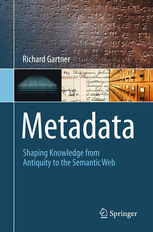 Metadata: Shaping Knowledge from Antiquity to the Semantic Web is for all readers with an interest in how we humans organize our knowledge and why this is important. It is suitable for those new to the subject as well as those know its basics. It also makes an excellent introduction for students of information science and librarianship. What Metadata is and why it Matters.- Clay, Goats and Trees: Metadata before the Byte.- Metadata Becomes Digital.- Metadata as Ideology.- The Ontology of Metadata.- The Taxonomic Urge.- From Hierarchies to Networks.- Breaking the Silos.- Democratizing Metadata.- Knowledge and Uncertainty. Richard Gartner is a librarian and academic who has specialised in the field of metadata and digital libraries for over twenty years. He is currently the Digital Librarian at the Warburg Institute in London. Previously, he was for sixteen years the New Media Librarian for the Bodleian Library in Oxford, where he was responsible for the introduction of the Internet into the Library, its first CD-ROM network and its first digital imaging projects. More recently he was a lecturer at King’s College London where he taught and researched metadata and digital curation. Throughout his career, his research has concentrated on metadata, a subject in which he has published widely. He is on the editorial board for METS (Metadata Encoding and Transmission Standard), a widely-used metadata standard in digital libraries. He has also maintained a long-term interest in international librarianship, which has taken him in the past to China, Bangladesh, India, Taiwan, Uzbekistan and Armenia amongst other countries.